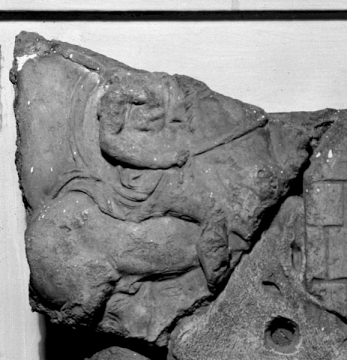 The body and horse from a plaque showing a rider followed by a standard bearer. The heads of horse and rider, the foot of the rider, and the legs and tail of the horse are broken away, as is the remainder of the scene. This piece is a mid first century AD reproduction of an Augustan prototype. 1 H. Von Rohden, and H. Winnefeld, Die antiken Terracotten, vol. IV. 1,2, (Architektomische römische Tonreliefs der Kaiserzeit. ), pp. 136, 266, pl. LV. The two mounted frames of 'Campana' reliefs, Vermeule 459 and and several of the separate fragments must have come from Rome, for a number appear to be drawn in the Windsor folios, nos. 11496ff.